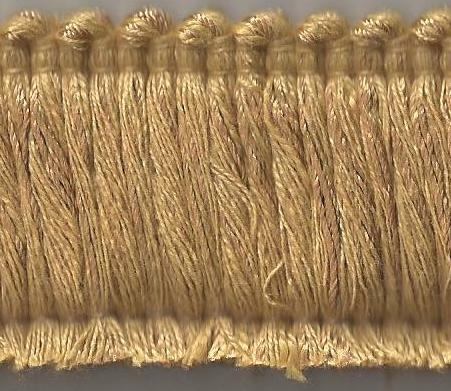 1 3/4" polyester brush fringe from our Duke Collection in color coin gold. The measurement is from the top to the bottom. It is sewn at the bottom to keep it neat, just remove the thread by pulling it off to allow the brush fringe to fluff up. This item has been discontinued. I have this color in 2 pieces, 1 yard 29" and 1 yard 9". We are offering it as a 3 yard piece for $15.00. Both cuts are from the same roll, so the dye lots match. Please enter 1 into the basket to get both pieces.